Re-purposed objects such as a butter paddle or a wood panel became the canvas of a folk artist. Making her home more inviting and following the Victorian magazine arts of the time, Vona Donald chose bucolic rural winter scenes to enhance and decorate her environment. With paint and inspiration, the rural landscapes brought character to these daily objects. The residence of the Donald family was an emblematic representation of life in the early 20th century Wisconsin through its many objects and artifacts. These are some of the dozens of artifacts that came to the Mt. Horeb Area Historical Society from the estate of Delma Donald Woodburn (1899-2001), who carefully documented and preserved the material heritage of her family’s life in Mount Horeb and Madison, Wisconsin. The artifacts span several generations, beginning with two early pioneer families who came to the rural Mount Horeb area from New York state in 1855–William Sweet and Sally Clark Sweet and Reverend James Donald and Margaret Strong Donald. The large collection of objects of Delma Donald Woodburn included many objects of different categories, utensils, clothes, and other artifacts. By this time, in the 19th century, women’s magazines promoted household craft and decorations. Young ladies were expected to learn domestic skills and even common household goods became a pallet for artistic expression. Parlors and family spaces were filled with this kind of craft, making her home more inviting and following the Victorian magazine arts of the time. Vona Donald chose bucolic rural winter scenes to enhance and decorate her environment. With paint and inspiration, the rural landscapes were one of the frequent motifs that brought character to these daily objects. Objects such as the butter paddle, the wood panel, the picture frames and the cutlery box are examples of the use of daily artifacts as the folk artist’s canvas. Their work added personality to each object making them unique. Some of those artifacts later became a piece of remembrance of a loving relative. Besides decorative painting, many other elements were used in these craft projects. Norwegian -American folk art went far beyond rosemaling and acanthus wood carving. 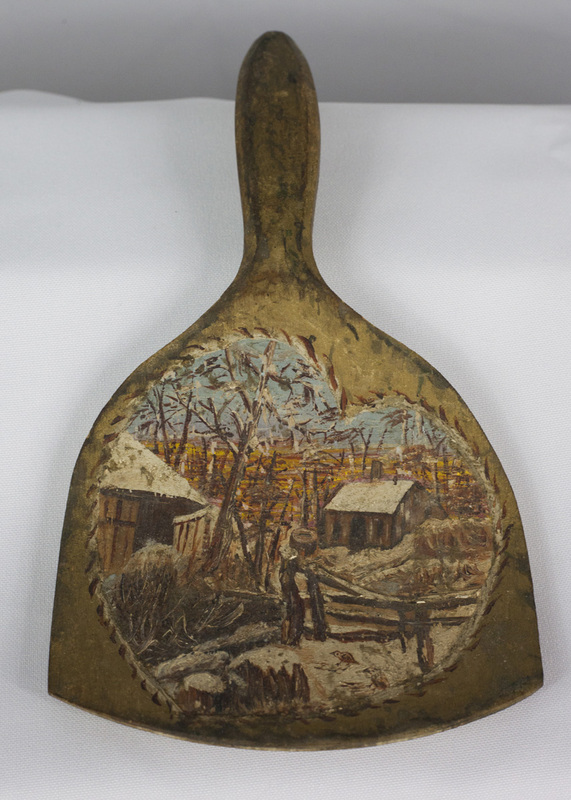 Wooden butter paddle painted with a heart-shaped vignette of a rural landscape, including two buildings, a fence and trees. The entire image is frosted with gilt. Woodburn attributed this paddle to her mother, Vona DeCrow Donald, who came to the Town of Springdale, Dane County from Valparaiso, Indiana in 1898 after her marriage to Springdale native John Sweet Donald (1869-1934), a state assemblyman (1903-1906), state senator (1909-1912), and Wisconsin secretary of state (1913-1917). In 1917, the Donald family moved to Madison, where John Sweet Donald joined the faculty of the College of Agriculture at the University of Wisconsin and Vona Donald worked on a number of progressive causes, including the Dane County Child Welfare Board and the League of Women Voters.